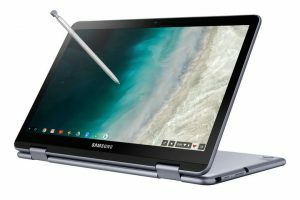 The Samsung Chromebook Plus V2 retains the signature hallmarks of its predecessors, including a stylus with its own silo on the device, a premium build quality, and a convertible form factor that makes it a great machine to run Android apps. This year, the Chromebook Plus V2 ditches the ARM processor from last year in favor of Intel’s Celeron 3965Y silicon, which should give it a boost in performance. Alongside the new Intel chip are 4GB of RAM and a 32GB drive for storage. The Celeron processor also comes with Intel’s HD Graphics 615 integrated. Connectivity is handled through the two USB-C ports, a single USB 3.0 port, a 3.5mm headphone jack, and a MicroSD card for up to 400GB of extra storage. Another big upgrade for this year’s model is a secondary camera on the rear. The front camera clocks in at 1 megapixel, while the rear camera has a 13-megapixel F1.9 lens with autofocus. The second camera is located on the keyboard deck. Samsung has made big improvements to the keyboard to make it easier for typing and more durable. The keyboard now comes with curved key caps and is designed to be spill-resistant. Samsung claims it can withstand spills up to 60cc. This year’s v2 uses a 12.2-inch display with a standard 1080p resolution, while the original model came with a 12.3-inch panel with a higher 2,400 x 1,600-pixel resolution. That means that along with a lower resolution display, the panel’s aspect ratio has also changed from a 3:2 to 16:10 this year. While 1080p will likely suit most users fine, the display is a notable downgrade from the first-generation model. The Chromebook Plus V2 will be priced at $499 when it launches later this month. The information for this post wast taken from an article by Chuong Nguyen in DIGITAL TRENDS, follow this link for more details and the complete article. Here is some additional information from various sources: liliputing, androidcentral, 9to5Google, Laptop, and SAMSUNG NEWSROOM U.S.